Dr, Rais Fatima's work dealing with the contribution of the Arab poets of the Middle Ages to ghazal, a form of lyrical poetry in Arabic, is truly a comprehensive .and analytical survey of the subject. Man must have courted women since antiquity by employing various means of expression, but the most appealing and inspiring must have been poetry. Hence, poetry reached its apogee in the form of lyrics which were meant to be sung, for poetry through music has a greater and direct appeal. With the ancient Arabs, poetry was their second nature. In the vast expanses of the desert, the rigours of the calimate and the search for waters fresh and pastures new, singing the verses of the ancient bards must have given the Arabs spiritual tranquility and mental peace, and sung in the melodious Arabian music, it must have roused their sense of yearning for the beloved. During the Umayyad period, Arabic poetry acquired a higher form of pure ghazal, which became popular with the passage of time. This form deeply influenced world literature. Ghazal became the primary mode of expression in Persian which produced great poets like Sa'di and Hafiz. In modem times, it influenced Urdu, which gave us the greatest ghazal-writer of modem times Ghalib. Arabic ghazal, also influenced spanish Arabic poetry, where the special form, al-muurashshah, was developed, and produced the troubadours in Provence. Dr. Rais Fatima was born in Sitapur, U.P. and educated at different places as her father was in a transferable Govt. Job. She passed High School Examination in the year 1964, Intermediate as a Private Candidate and got her B.A Degree as a Student of Women's College, A.M.U., Aligarh. She completed M.A in Arabic from A.M.U., Aligarh, in the 1st Division and was awarded the University Medal for obtaining the 1st Position in 1970. She went on to get B.Ed. Degree from A.M.V. in 1st Division and ultimately got Ph.D. from the same University. Now, Dr. Rais Fatima is a reader in Islamic Studies in Women's College, AMU. She has been writting articles and translating from Arabic to Urdu. Her first article was published in 'Munadi', Delhi in November, 1965. Since then she is contributing to the journals of National and Inter- national fame. Her articles were also indexed in 'Index Islamicus' printed in Great Britian, 1983 by Mansell publishing Limited in Historical Abstracts and America: History and Life-Bibliography of the World's Periodical Literature, American Bibliographical Centreclio Press, Peviero Campus, Santa Barbara, Calfornia, U.S.A.
She was a member of the Borad of Studies in Arabic, Pubjab University (Chandigarh) for six years. She was also elected and served as a member of the Academic Council of AMU for two years. She is a Keen Scholar and takes active part in Curricular and Co-Curricular activities. 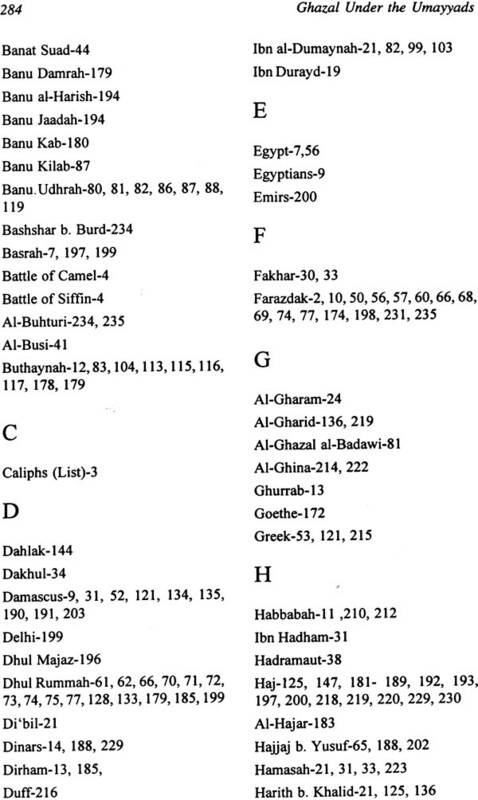 The known history of Arabic literature dates back to 130 years before Hijra (622 A.D.). As in most other languages of the world, so in Arabic, poetry flourished much before prose. But what distinguishes Arabic from other languages is the fact that the oldest specimen of its poetry which have come down to us exhibit such a high standard of excellence which is difficult to find in the early poetry of other languages. Not only this, the rules and regulations which the earliest Arab poets followed in their compositions were well defined and fully laid down. This indicates that perhaps the compositions of Arabic poetry had started much earlier but its specimen could not be transmitted to us as the ancient Arabs usually did not know how to read and write and they used to remember poetry only by heart. So the poetry which was composed beyond a certain period of time had been lost. The most popular form of poetical composition, not only during the pre-Islamic period but even after the advent of Islam, was kasidah. Love poetry, which was known as nasib or tashbib (amatory prelude), was placed in its beginning. It was only during the Umayyad period (661-750 A.D.) that love poetry flourished as a separate form of poetical composition. 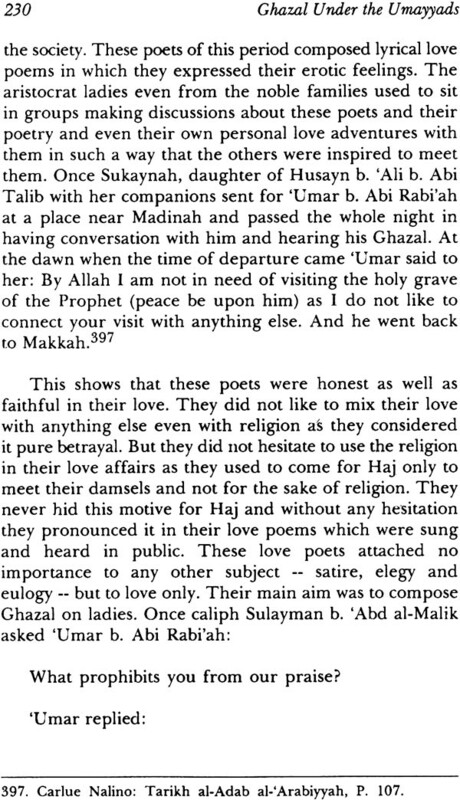 The two main schools of love poetry, besides the traditional one, were Udhrite and Umarite. They developed in Hijaz. The main exponent of the Udhrite Ghazal was Jamil bin Ma'mar al-'Udhri (d. 701) and that of the Umarite Umar bin Abi Rabiah (d. 719). 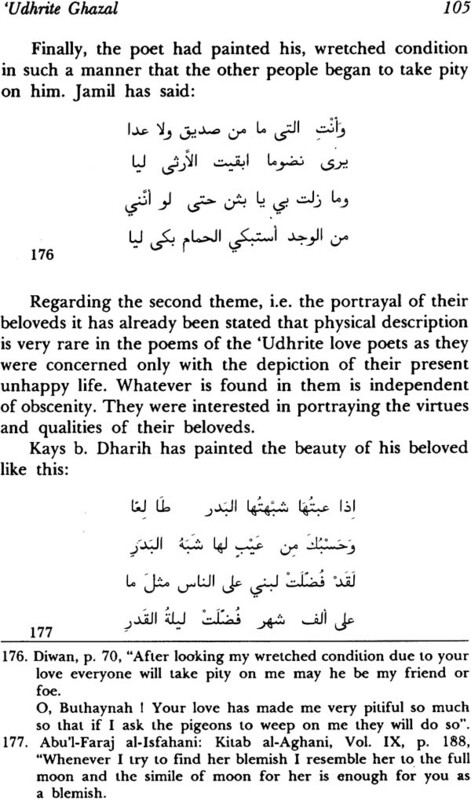 The Udhrite Ghazal represents true or chaste love, while the Umarite Ghazal gives expression to licentious love. Dr. Rais Fatima is a fine product of the Department of Arabic, A.M.U., Aligarh. She has been teaching Arabic in Aligarh Muslim University for the last 14 Years. She has made a thorough and critical study of love poetry in all its aspects during the Umayyad period and has referred to a large number of the poets of each category and has quoted their verses generously in support of her point of view. She has also dealt with Ghazal before the Umayyads which has helped in bringing out the contribution of the Umayyad poets in this field of poetical composition very vividly. Here she has also traced the history of the use of the word Ghazal in Arabic poetry which is very useful. She has also dealt with the social and political condition of the Umayyad period which serves to provide a substantial background to her work. 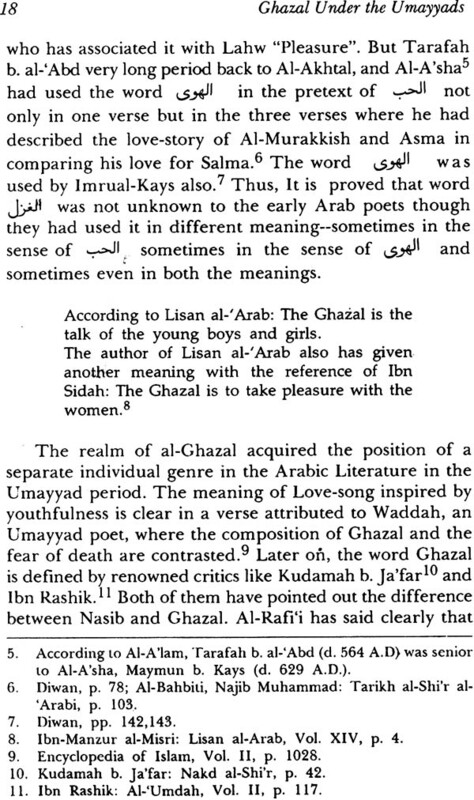 At the end of the work the factors responsible for the development of Ghazal, particularly under the Umayyads, have been enumerated by the authoress. According to her these factors were environment and nature of an Arab, relations between male and female, Arab's fondness for the Ghazal, literary salons and manifestations of luxury. She has devoted much space to each of these factors and brought out their relevance to the development of Ghazal admirably. As a whole, this is a useful and admirable study and, to the best of my knowledge, this type of effort has been made for the first time at least outside the Arab world. I hope that Dr. Rais Fatima's effort will bear fruit and generate further interest in the study of Arabic poetry in general and the literature of the Umayyad period in particular. The study of some of the aspects of prose or poetry in general is undeniably more difficult and complex an exercise than undertaking research and writing something about a literary figure and his achievements. The topic of the present work is therefore very challenging for it aims at teaching the development of the Ghazal in Arabic Literature. 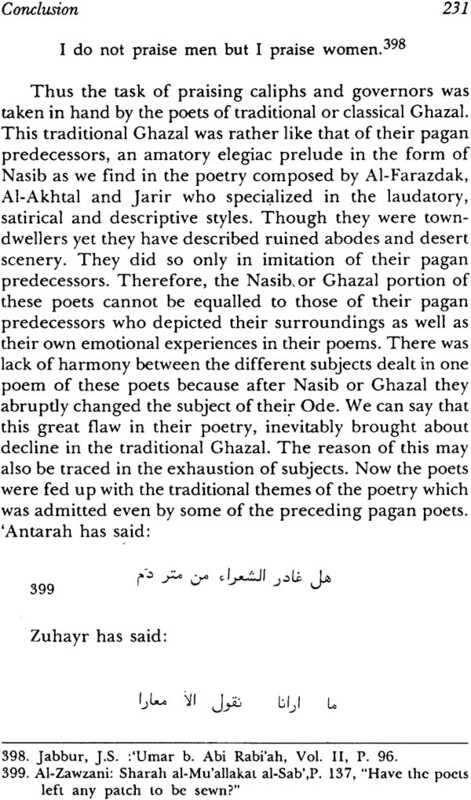 The poets composing Ghazal have been mostly criticised by religious zealots. But their Ghazal have always had n universal appeal for the common reader. Ghazal is, in fact in Arabic word Al-Ghazal which had become extant in Arabia since the pre-Islamic period. But Ghazal was later adopted by some other languages like Persian and Urdu for love poems. 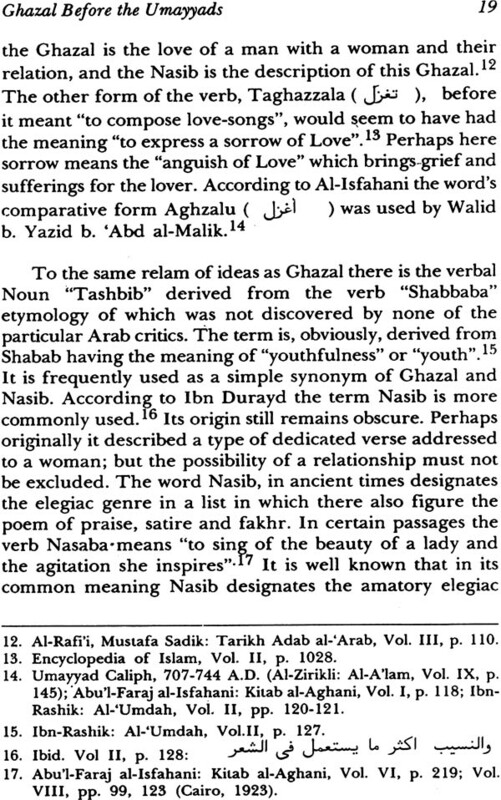 A number of factors were responsible for the development of Ghazal in the Arabic literature. The present work seeks to analyse some of these major factors. The work also aims at evaluating the contributions of the Ghazal-Poets in Arabic. The sources made use of are some of those authorities of literary history who provide ample material for discussing these poets as well as for evaluating their poet excellence. These assessments have been substantiated by the text of the available Diwans of these poets. The history of Arabic Ghazal can be divided into five phases. But the first two topics i.e. pre-Islamic and early Islamic Ghazal will be dealt with briefly and the third one i.e. in the Umayyad Period will be discussed at length. Some problems during the course of the study were created because the authorship of some very known couplets became doubtful as these were attributed to more than one poet. After carefully examining the evidences I came to the conclusion that these discrepencies were perhaps because of the fact that the art of writing had yet to be developed at that time. But this is a complex literary problem and cannot be possibly covered in this book. In fact it requires a full length and extensive research in anthologies or human retention. Chapter I of this book deals with three sub-topics. 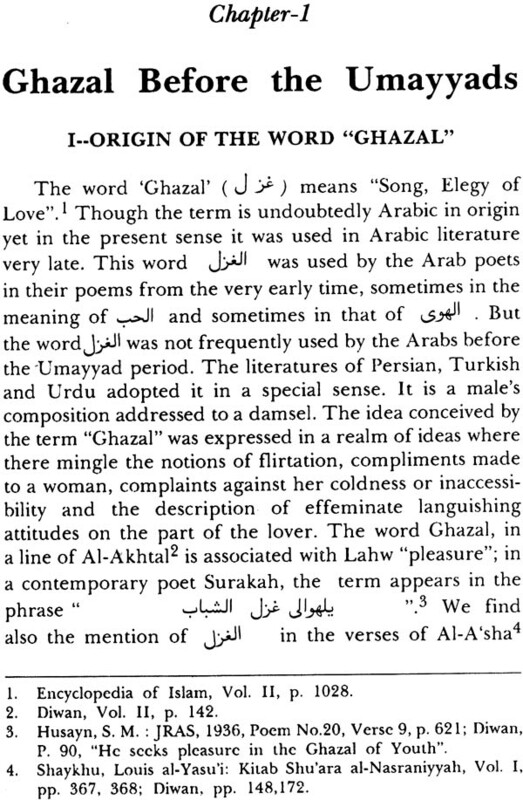 First, it traces the origin of the word al-Ghazal and strongly refutes the opinion that Ghazal is not of Arabic origin. Secondly, it deals with the love poems composed by the pagan poets in the form of Nasib or Tashbib and also discusses at length its bonafide as Ghazal. 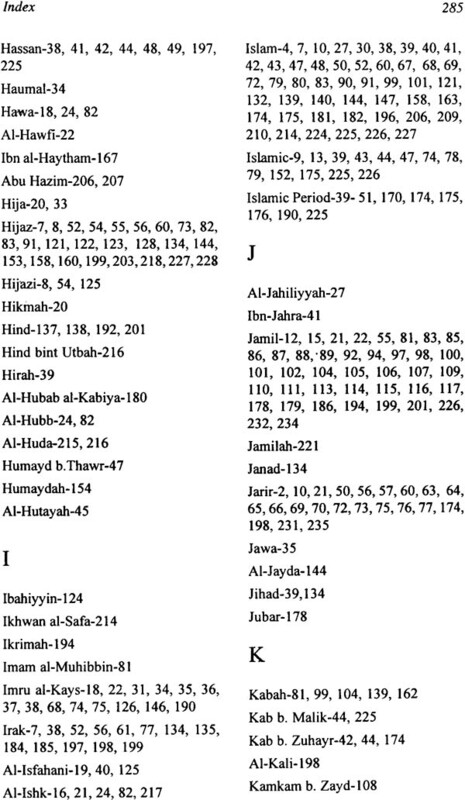 Thirdly, the position of Ghazal in the literature of early Islamic period has also been discussed. In this conncetion references to few contemporary poets have also been made and their poetical expressions critically examined. This chapter is a necessary prelude to tracing out the development of the Ghazal. It is an undeniable truth that through poetry one can feel and understand the soul of people. yet the subject of its (especially of Love Poetry) development and evolution has never received the attention it deserved. The present work may remove this notion and also serve as substantial contribution to the critical study of Arabic Literature. This book also deals with the period which marks a change of mood in Arabic writing as well as the various forms of Love Poetry. Also special attention has been paid to the remarkable continuity and an evolutionary relationship between Arabic poetry before and after Islam. It was not possible to discuss all the poets. But the poets mentioned in this book are considered as representatives of love poetry in Arabic literature. Therefore while relating the changes in the pattern of Arabic Poetry an attempt has also been made for detailed and indepth study of these poets and their works in the productive years after the period of the orthodox caliphs. The main Chapters of the book is followed by illustrative excerpts from love poems. The transformation of the Arab spirit in English is difficult. It is true that the translation always mars the originality as the personal idea of a poet, the melody of his verse and the implications of his imagery are mostly blurred in the process of translation. However I tried hard to maintain the objectives and the spirit of the Arabic verses in transforming them into English. This book is in fact a revised version of my thesis submitted in the Department of Arabic A.M.U. under the title "Contribution of the Umayyad Poets to the Development of Ghazal". In fact I did not realise the immensity of this project when I took it up initially. But thanks to the helpful criticisms and suggestions of many learned scholors like Prof. S. Maqbul Ahmad, Prof. Emeritus, presently Director, Zakir Hussain Institute of Islamic studies, Jamia Millia Islamia, New Delhi; prof. Rizwan Alvi, Chairman, Department of Arabic, Lucknow University, Prof. S. Sulaiman Ashraf, then Chairman, Department of Arabic, Delhi University; (Late) Prof. S.R. Chawdhry, Gurukul kangri University, Hardwar. I should not fail to thank Prof. Mohd. Rashid, Chairman, Department of Arabic, Aligarh Muslim University; Prof. Mohd Mehdi Ansari, Ex-Chairman, Department of Arabic, Aligarh Muslim University, for the advice and support extended by them. i will be ungrateful if I fail to express my gratitude to Dr. S.M. Asadullah, Lecturer, sunni Theology, Aligarh Muslim University, for his valuable suggestions and counsel. I owe more than I can possibly express to my husband Dr. S.M. Imran, a social scientist, who very patiently shared with me the successes and disappointments during the course of my study leading to the completion of this work. Maulana Azad Library, A.M.U. ; The library of Centre of West Asian Studies, A.M.U. ; Islamic studies and Arabic Department library A.M.V. ; Khuda Bakhsh Oriental Public Library, Patna; Libraries of Delhi and Lucknow Universities. Undoubtedly Umayyad period is very interesting and also very important particularly for the critics of poetry as during this period a dynamic development not withstanding the fact of social and political traditions took place in literature. This period of fast development was in fact flanked by two well settled periods of poetic creations on the one side was the pre-Islamic era and on the other 'Abbasid. The poems of AI-Akhtal grew out of a well rooted tradition and developed to perfection while the verses of 'Umar b. Abi Rabi'ah left a different impression. He composed experimental poetry but he did not model himself on the pattern of pre-Islamic heritage except occasionally. It is the Umayyad period in which many aspects of poetry were explored. The points of emphasis were shifted. It was in fact an unrivalled revolution which took place spontaneously in this period. The idea of poetry as an art also developed in this period. 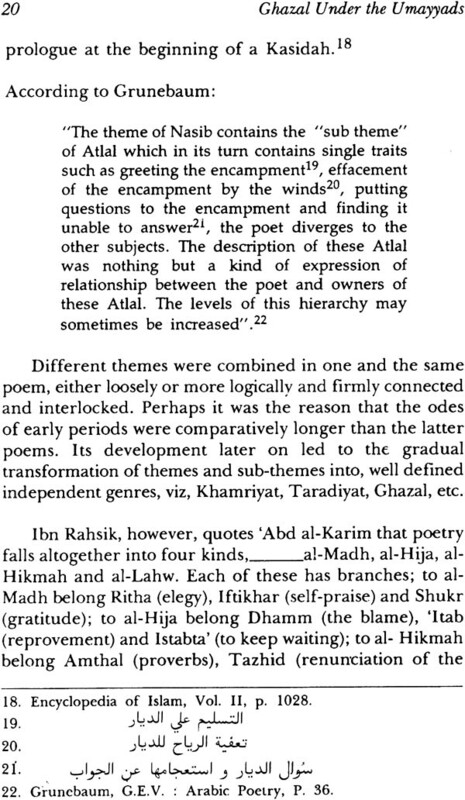 The importance of the poet in the life of the 'Arabs never diminished. 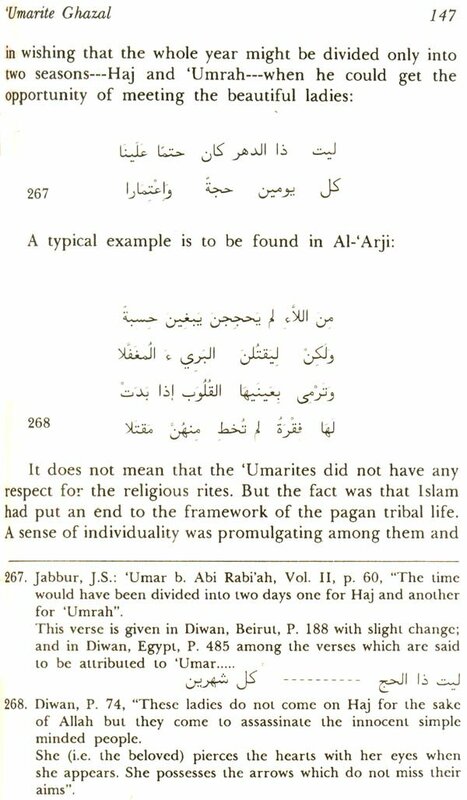 It was the same under the Umayyads as was in the pre-Islamic period. 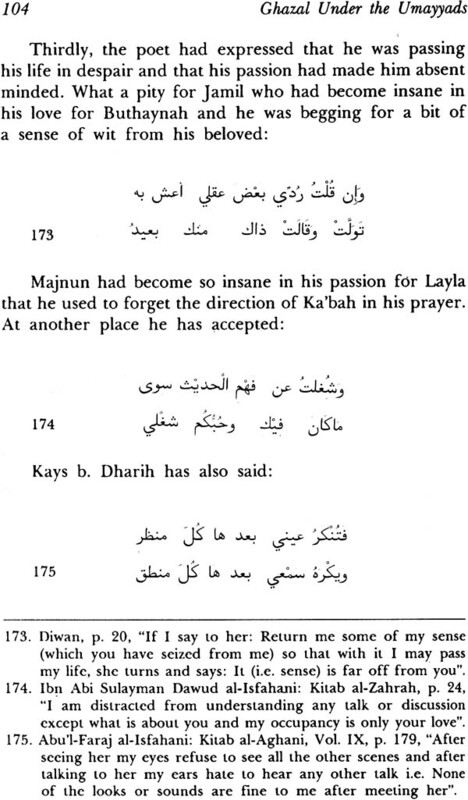 In the pre-Islamic period the family was wished and congratulated if any member of it turned out to be a poet. Feasts were arranged, the women of the tribe joined together in bands, playing upon lutes as they used to do at bridals, for the poet was considered to be a shield to defend the honour of family, even he was considered a weapon to ward off insult from their good name and a means of perpetuating their glorious deeds and establishing their fame for ever. A pagan poet was considered to be the oracle of his tribe, their guide in peace and their champion in war. His powers were chiefly exhibited in Satire. The menaces which he hurled against the foe were believed to be inevitably fatal. One day Muhallab b. Abi Sufrah, the governor of Khurasan, while marching against the Azarikah, a sect of the Kharijites, heard a great clamour and tumult in the camp. On enquiry he came to know that the soldiers were fiercely disputing over the comparative merits of Jarir and Farazdak and they requested him to give his decision over it. Muhallab said: "would you expose me to be torn in pieces by these two dogs'? I will not decide between them. But I will point out to you those who care not a whit for either of them. Go to the Azarikah. They are Arabs who understand poetry and judge it aright". Next day when armies faced each other an Azarikite named 'Ubaydah b. Hilal stepped forth from the ranks and offered single combat. One of Muhallab's men accepted the challenge but before fighting he begged his opponent to inform him which was the better poet-Farazdak or Jarir? 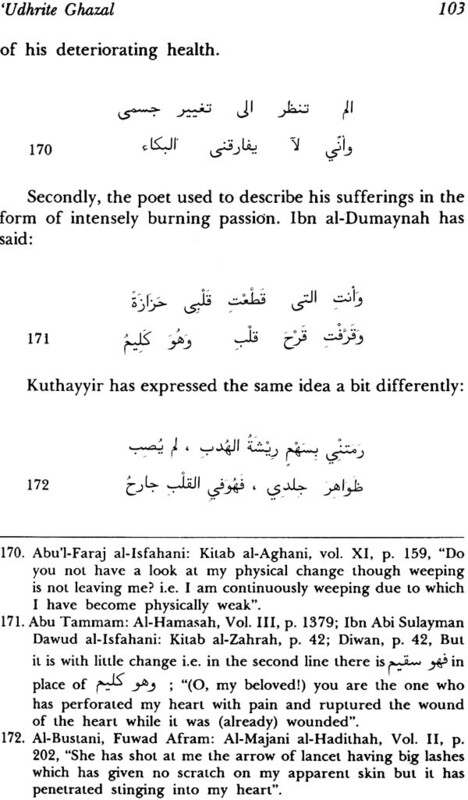 "Allah may disgrace you" cried 'Ubaydah, "Do you ask me about poetry instead of studying the Kur'an and the sacred law?" Then he quoted a verse by Jarir and gave judgement in his favour. The Arab poet's patron was first the tribe, then the caliph, then the Sultan, then the king; today it is the nation and the party. It was perhaps because the patrons often encouraged poets for their own self aggrandisement. Pre-Islamic poet used to stuck to his patron whether a tribe or clan but the poet of later period was ready to change his patron if the change was more profitable to him. There were examples when the patron disappointed a poet and he changed his attitude and composed a bitter satire to lampoon him.